The Japanese theme is always in fashion. Rolls and sushi, manga and anime, Japanese writers, and Japanese interior style became a part of our lives. Advanced youth are studying the language and the culture of Japan. And we probably all know the look of the Japanese geisha. This type of makeup is perfect for parties. Here we are going to learnhow to achieve the Japanese geisha look. To begin with, cleanse and moisturize yourfaceto prepare it for the application of a large amount of makeup. If it is necessary, apply a special concealer to get rid ofthe dark circles under the eyes. The next step is toincrease the whiteness of your skin. This can be achieved in different ways. You can use theatrical makeup or the lightest of the common foundation. Do not forget about the neck! The contrast between the face, the neck, and thedécolleté is unacceptable in any makeup style, but in this case, it will be particularly noticeable. After applying cream, apply light or white powder, which will make your skin extrasmooth and help avoid that oily sheen. Another important attribute is clear, bright, arched eyebrows. For eye shadows, you are going to want to use dark reddish and purple shades. Wingsare required to give an expressive contour to the eyes. A geisha's look must affect the heart, leavingan unforgettable impression on men.This is what we will try to achieve. Finally, pay attention to your lips. Apply your lip pencil and lipstick and make your lips look like a bow or a heart. Everything connected with geishas has a shade of a legend, shrouded in an aura of romance and mystery. Timespent with geishas was considered a high honor and reward. Geishas were educated, which was rare for women at that time. They had comprehensive knowledge, were open-minded, and were able to hold fascinating conversations. At the end, they were to decide howto end communication. The geisha, fragile like a porcelain doll, actually might have a considerable amount of influence. This is surely a very interesting image, and it is no wonder the Japanese geisha makeup is so popular nowadays. Try the Japanese geisha look andyou will surely find yourself in the spotlight. But do not forget about the appropriate hairstyle, accessories, and clothing. Be patient andconsistent, and the result will exceed all expectations! Japanese Makeup: Beautiful Asian Style it's Great! 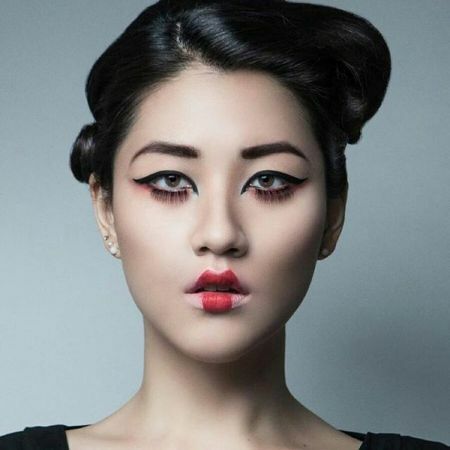 Like the article «Japanese Geisha Look - Asian Beauty Style Make-up»? Share it with friends!